Cybernetics' Virtual Tape Libraries are designed to eliminate the challenges you face in archiving and protecting your valuable data. Our units are incredibly easy to install, manage, scale and will adapt as your network changes. What is a Virtual Tape Library? A VTL is a storage device that emulates one or multiple tape drives/libraries. It's designed to greatly reduce your backup window and increase your restore speeds, especially when compared to tape drives. They can also reduce the amount of disk storage you need for long term data retention and minimize the bandwidth required for site-to-site replication. By appearing as tape, you have 100% compatibility with any backup software that supports tape without any operational learning curve. This includes BackupExec, ARCserve, CommVault, Tivoli, DPM, native i5/OS backup commands, BRMS, Robot/SAVE, IPL and many more. There are no additional software/agents required. Whether you're running Windows, i5/OS or any Unix derivative, a single VTL can protect your entire data center easily. A well engineered VTL does not format the disk drives with a file system, thereby eliminating the need for virus scanning and defragmenting overhead; increasing your read/write performance. This is traditionally faster than using DAS, NAS and SAN for a backup repository. By emulating tape at the block level on disk, any off-line copies sent off-site via physical tape will remain compatible with your backup software. In an emergency situation, restores can be done without access to the virtual tape library. By utilizing a fault tolerant design, backups and restores become redundant. Unlike tape drives, jobs do not easily fail. With RAID protection, redundant power supplies and multiple connections supported, your data is highly available when you need it. Faster Backup and Restore Speed. As your data grows, so does the backup window. By installing a virtual tape library, you can reduce the time it takes to protect your data. It's not atypical to see a twenty hour backup to tape take less than an hour with a VTL. Restoring your applications and data is faster as well. What takes seconds and minutes with a virtual tape library can take many hours with a physical tape library. With tape, traditionally one backup job is created per tape drive. Multi-threading different backup jobs to one tape drive is supported by some software packages but cripples your restore speed. Virtual tape libraries can emulate many tape drives. Simultaneous backup jobs to one VTL greatly enhances your backup performance without negatively impacting restore times. Many corporations are looking to eliminate tape or greatly reducing their reliance on it by deploying virtual tape libraries. Technologies like deduplication and replication ensure you have multiple copies of your data in different geographic locations. You can store months to years worth of backups on cost-effective and redundant disk while needing less bandwidth. Unlike tape, disk backup solutions are easy to scale. Add more capacity dynamically when needed. Our virtual tape libraries can be purchased with just the capacity you need today and as your data grows, more disk drives can be added into the enclosure and expansion cabinets. With our modular design, you can change the transport protocols as needed. Use SCSI, SAS, iSCSI (1GbE and 10GbE) and FC (8G and 16G) simultaneously and upgrade to faster versions when available. Backups performed to a Cybernetics' virtual tape library can be offloaded to removable disk and/or tape. 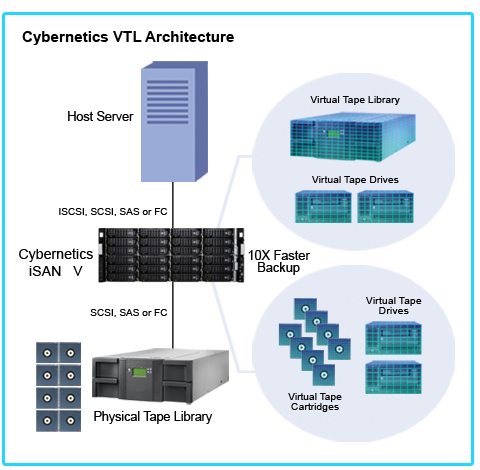 Multiple tape drives and libraries can be directly connected to the VTL via SAS/FC/iSCSI for off-line archiving. Unless encryption is utilized, tapes are not proprietary and can be restored using a tape drive and your regular backup software. Cybernetics' virtual tape libraries offer encryption “at rest” and “at flight”. Backups stored on disk can be encrypted as well as data replicated. Offloads to attached tape and/or removable disk drives can also be encrypted. If you can use a tape drive and your backup software, you can use our virtual tape library. With an easy “set it and forget it” interface, installation is super fast, traditionally less than an hour. Managing multiple virtual libraries can be done with one tab in your web browser. And if you need any assistance, access to our technical support team is a phone call away. 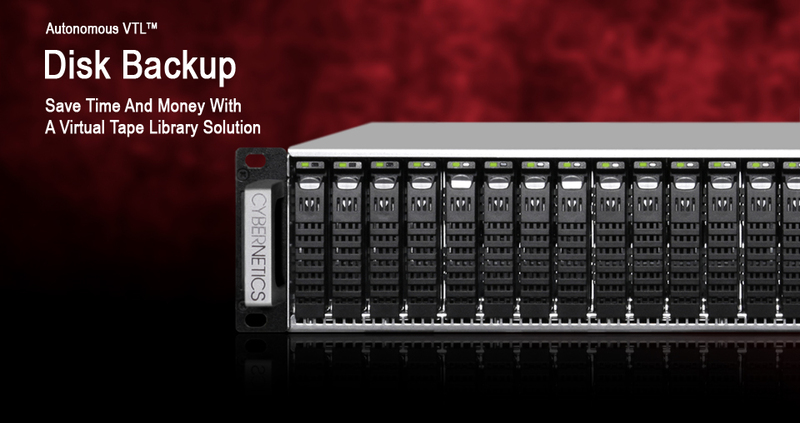 Lower the Cost of Backups and Archiving. Cybernetics' virtual tape libraries are among the most cost-effective solutions available. Not only is the cost of acquisition lower than our competitors, capacity expansions and warranty extensions are lower as well. With deduplication and replication, you can also reduce the amount you pay for long term storage and recurring monthly bandwidth. You can also save time, money and headaches associated with managing the backups.